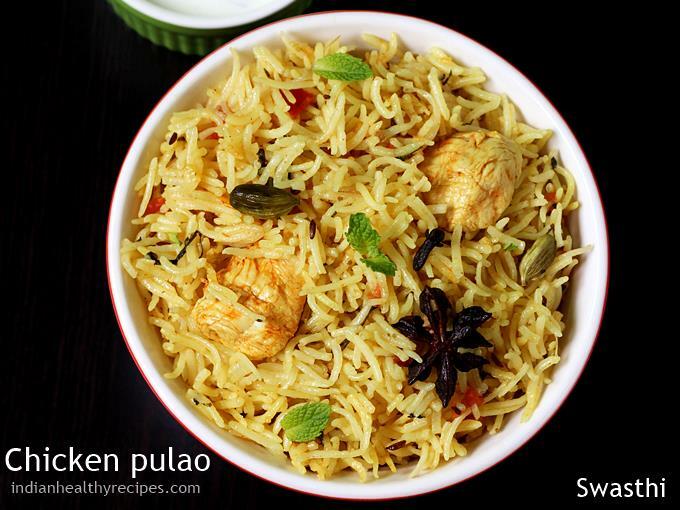 Chicken pulao recipe – One pot flavored chicken pilaf cooked with mild Indian spices. Pulao is a delicious dish made of basmati rice, meat or veggies, spices & herbs. This chicken pulao is super easy to make for a weeknight dinner. It is mildly spiced and not heavy like the Chicken biryani. Traditionally a Biryani is made by layering marinated meat and partially cooked rice. The pot is then sealed and dum cooked to trap the flavors. 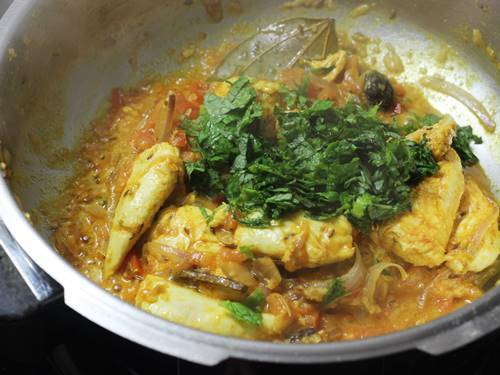 Making a good chicken biryani takes a considerable amount of time to plan & cook. 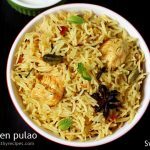 This chicken pulao comes to my rescue most often when we crave for a flavorful chicken & rice dish. It is not only super quick to make but very flavorful and tastes delicious. 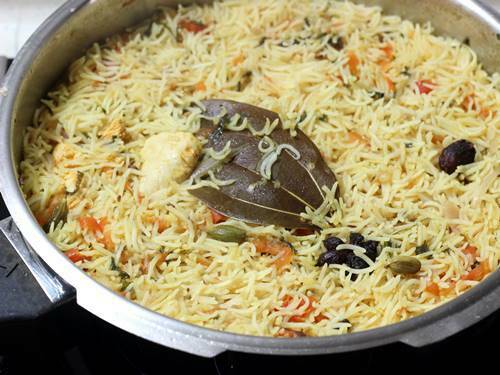 There are so many ways of making a chicken pulao. 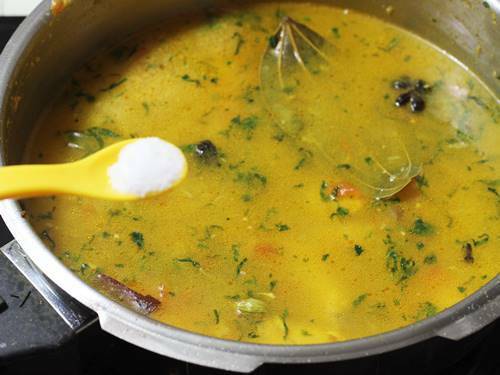 Some people use stock to cook the dish while in the south many people use coconut milk. But most times I make it with water alone. 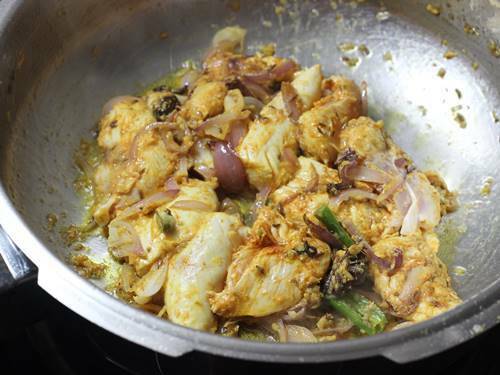 This is a kids’ friendly recipe too as it requires only a few spices. Chicken pulao is best served with a yogurt Raita or a simple salan. 1.Always wash rice at least thrice. This prevents the rice grains in the chicken pulao from turning mushy & sticky. 2. Next soak basmati rice for at least 20 mins. This helps the rice grains to expand well while cooking. So you can soak the rice and set aside until you are done with the other preparations. 3. Using whole spices is the key to this chicken pulao. However if you do not have then just replace them with any store bought chicken masala powder or garam masala. Follow the instructions on the pack for the quantity to use. 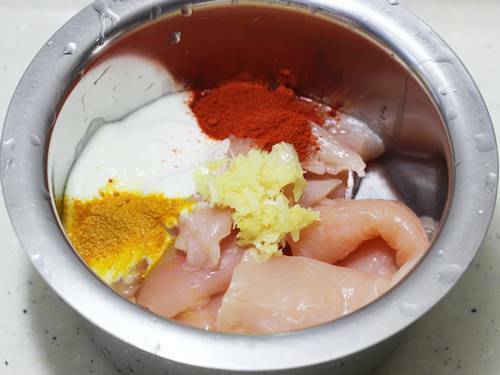 4.I prefer to use 1 to 2 tbsps of yogurt to marinate the chicken. This enhances the dish a lot and the chicken comes out very juicy & succulent without drying out. However you can skip this. 5. Mint leaves are a not to miss herb while making a chicken pulao as it takes the entire dish to a new level. if you do not have it then replace with cilantro or coriander leaves. Chicken pulao can be made in a regular pot, traditional pressure cooker or instant pot. You can find all the 3 methods in this post. Wash rice and soak for 20 minutes. Drain and set aside. 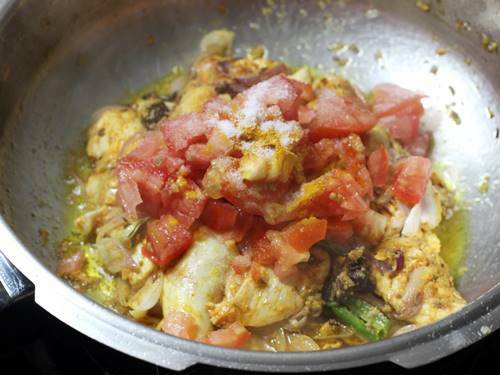 Marinate chicken with ingredients mentioned under to marinate. Set this aside till we use it. If using coconut milk do not use yogurt to marinate. 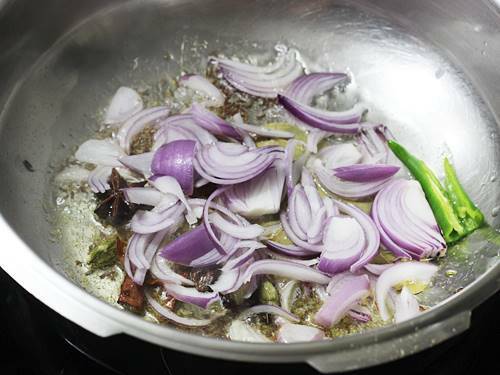 Heat a pot or cooker with oil, add spices along with saunf and saute till it begins to smell nice. Add onions, green chili and fry till lightly golden. Transfer marinated chicken and fry until it turns pale and white. This takes around 3 to 4 minutes. Take care not to burn. Add tomatoes. Fry until the tomatoes turn mushy, pulp and looks completely cooked. 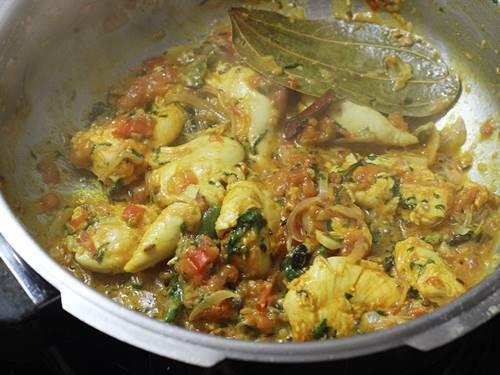 Add mint and coriander leaves and fry until it smells good for a minute or two. Make sure tomatoes are cooked, blended well with the mixture, then pour stock or water or thin coconut milk. If your coconut milk is creamy or thick, dilute it with water and measure. When it comes to a boil, add salt and rice. 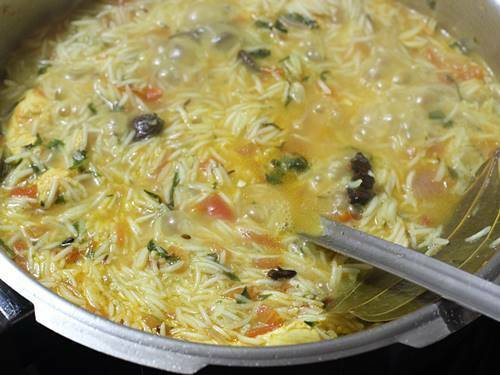 If cooking in a pressure cooker – do not allow the cooker to whistle if using basmati rice. If using normal rice then let the cooker whistle once. Serve chicken pulao with raita or plain yogurt. 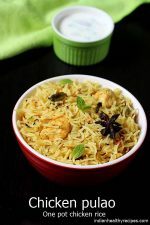 I have been using Instant pot for a while for most of my cooking and here is how I make this chicken pulao in instant pot. 1.Wash rice well thrice and soak for at least 20 mins. Set this aside. 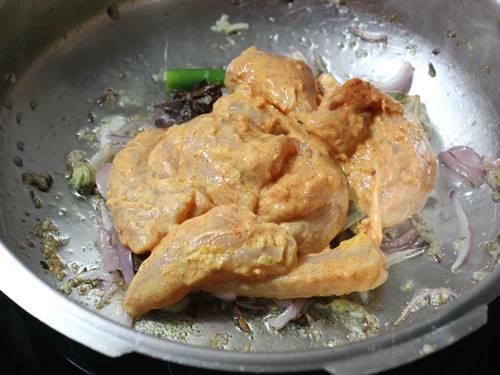 Meanwhile add chicken to a bowl along with, salt, turmeric, chili powder, ginger garlic, yogurt, garam masala (optional) and 1 tsp oil. Keep this aside. 2.Meanwhile slice the onion, tomato, green chili & herbs. 3. Pour oil to the inner pot of instant pot. Press saute. Add all the whole spices for a minute. Then add the onions and fry until transparent. 4. Quickly add chicken and saute for 3 to 4 mins until chicken turns pale. Add tomatoes (optional) & herbs. Fry until the raw smell of tomatoes goes off & the moisture dries up. 5. Then drain the water from the rice completely and add it to the pot. Also pour 2 cups water and add in little more salt. Mix everything well. Scrape off the bottom with a spatula if any bits of spices are stuck. This prevents a burn notice. 6. Press cancel & Secure the lid. Set the steam release value to sealing. Press the pressure cook button (high pressure) for 5 mins. When it is done, cancel and allow the pressure to release naturally for 10 mins. Then place a kitchen towel over the steam value & release the rest of the pressure manually. 7. Gently fluff up with a fork. Do not stir the chicken pulao a lot when it is too hot. Just allow to cool down a bit. 1. Wash and soak rice for about 20 minutes, if using normal rice soak for 30 minutes. Drain off the water and set aside. 2. 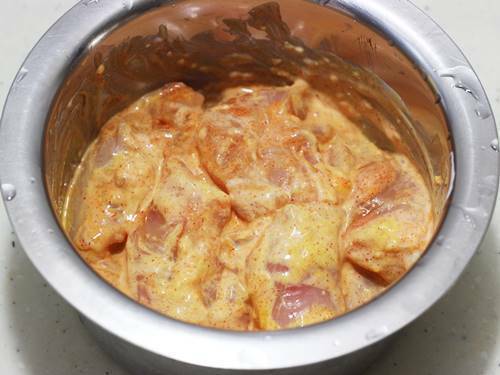 Marinate chicken with turmeric, chili powder, salt, ginger garlic paste, 1 tsp oil and then yogurt. 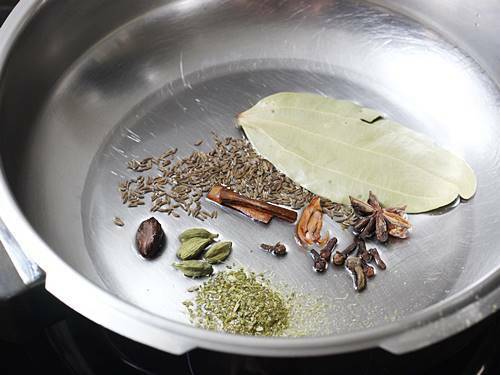 You can also add a tsp of good garam masala powder. This is optional. Yogurt makes the chicken tender. If using coconut milk for the recipe, skip using yogurt for marination. 3. Set this aside till we need. 4. Pour oil to a pressure cooker or pot. When it turns hot, add dry spices including fennel powder. Saute till the spices begin to sizzle. 5. Add onions and fry until lightly golden. You can lightly brown them as well. 6. Saute chicken on a medium flame. 7. Chicken should turn white in color and partially soft cooked for about 3 to 4 minutes. Otherwise chicken may turn hard after adding tomatoes. 8. Next add chopped tomatoes. Fry till the tomatoes turn mushy, soft and completely cooked. 9. Add chopped coriander and mint leaves. Stir and fry until the mixture begins to smell good. 10. Continue to cook till the moisture from tomatoes evaporate. 11. Add stock or water or thin coconut milk. Also add salt. We have already added salt to marinate, take care not to add too much. 12. 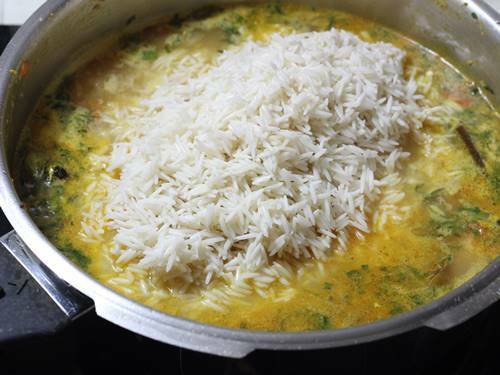 When it comes to a boil, add drained rice. 13. Stir and cook till the water almost evaporates. When there is very little water left. Cover and cook on a very low flame till the rice is done. 14. 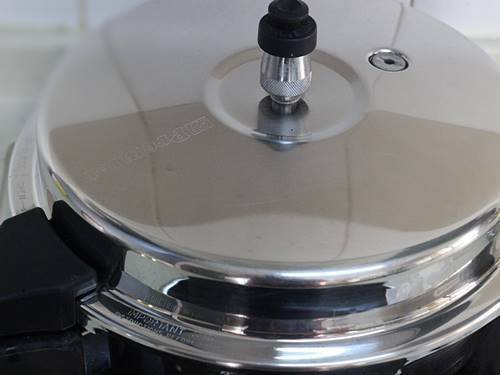 If cooking in a pressure cooker, cover the lid and cook just for 3 to 4 minutes. I do not let the cooker whistle. If using normal rice, you can allow the cooker to whistle once. 15. When the pressure goes off. Remove the lid and leave it for about 5 minutes. Fluff up gently. Serve chicken pulao with onion raita. This recipe is a breather for beginners like me … It’s easy and highly delectable… A must try for all. Excellent.. thanks for wonderful recipes. You are welcome Soma. Thank you so much. “Keeping it light” that is the key. I always go overboard and that makes mine a mush. Thanks for the comment. Glad to know it came out good. WoW I am a masterChef now . Glad to know you made it so good. Thanks for the comment. Welcome and thank you so much for rating the recipe. Super recipe smells and tastes delicious ! !